Just took up another hobby. On the trip to Greece in the summer of 2009, I brought back a few pieces of olive wood that had been trimmed off the trees. I had intended to make something for a gift for my sister-in-law who arranged out trip to Greece. The wood sat around for a few months and then I finally got around to doing something with it. Of course it required buying some new toys. In the Sunday newspaper was a 20% off coupon from Harbor Freight so I decided it was time to get to work. So I went to Harbor Freight and picked up this little mini lathe for about $99 after the discount. I set it up in the garage on the workbench, but it took about 3 days to get the other junk off the workbench to make room for the lathe. I got some other supplies and make a simple stick pen from one of the olive branches in the top photo. I used a chunk of burly stump wood for the pen base. I also make a little detatchable keyring from the other end of the branch. The keyring had a detatchable ring at one end. The kits are available at Woodcraft for about $5. I also picked up a few pen kits to make some pocket pens. The wood for this one was left over from one of my amplifier projects. There was a little bit of wood left over from the burly olive stump wood, so I cut it into some rectangular blanks for future projects. Just getting started on this hobby and webpage in Jan 2010, so will be adding more soon. 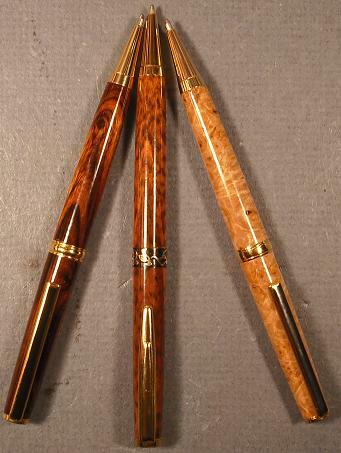 Below is a zebrawood click pen I made for dear old mom. 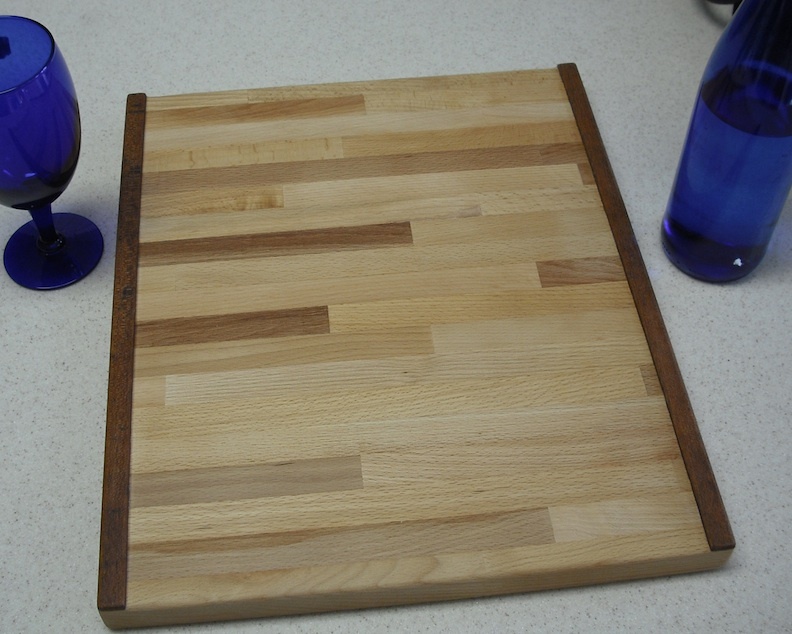 The bland was a diagonal cut wood blank. I started using the boiled linseed oil and CA glue finishing technique and started getting better shine on the finish with the acrylic in the super glue. Wall Street II click pen with madrone burl wood. Woodcraft Click Pen with Golden Ambyona burl wood. Woodcraft mechanical pencil in zircote. Woodcraft Click Pen in bocote. Wall Street II black platinum click pen, can't remember the type of wood, maybe cocobola. Credit Card twist pen in East Indian Rosewood. Just finished making this pen assembly press. The base is made of marblewood, the handle and plunger are persimmon, the blocks holding the handle are lignum vitae, and the moveable block is hickory. The hickory block has 2 pegs that fit in to the holes so you can move it to whatever position you need to assemble different lengths of pens. My son says it looks more like a cannon. I saw a photo of a mini lathe workstation on the internet, where you could buy the plans, but it had a pretty good photo, so I just made one going from the photo. It has sliding front doors to keep the shavings out of the cabinet, and a power strip on the back, plus a shelf, and adjustable leveling feet. 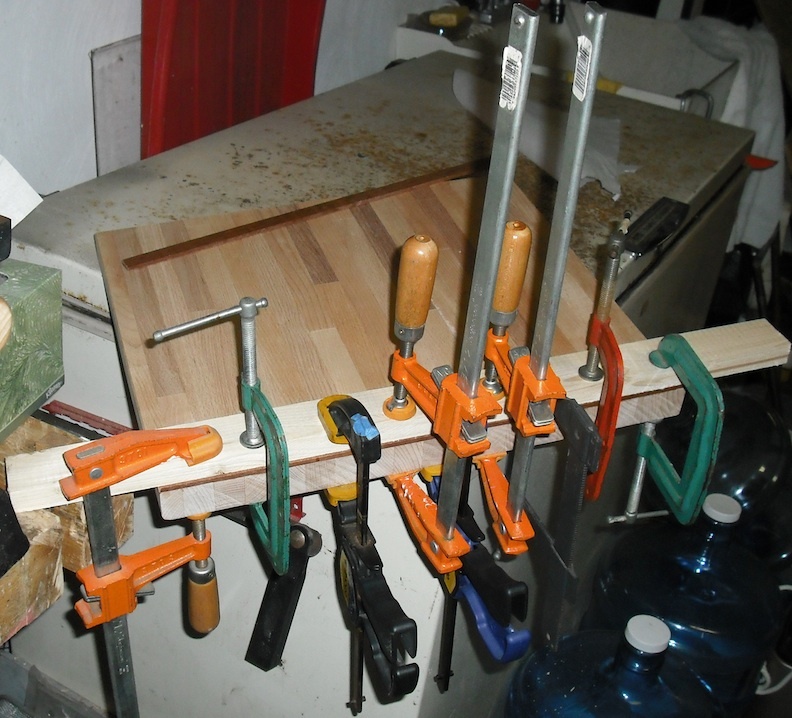 I am planning to make a rack for the lathe tools inside the cabinet. There is a grinder, pen press, and marble surface for sharpening on the top. The sides and back are made of 1/4 inch pegboard so you can hang stuff on it with pegboard hangers. I had just bought the new Jet mini lathe, and it is a superb machine. A few more pens recently completed. This was another Wall Street II black titanium click pen kit made using desert ironwood. It is the one I keep in my pocket now. 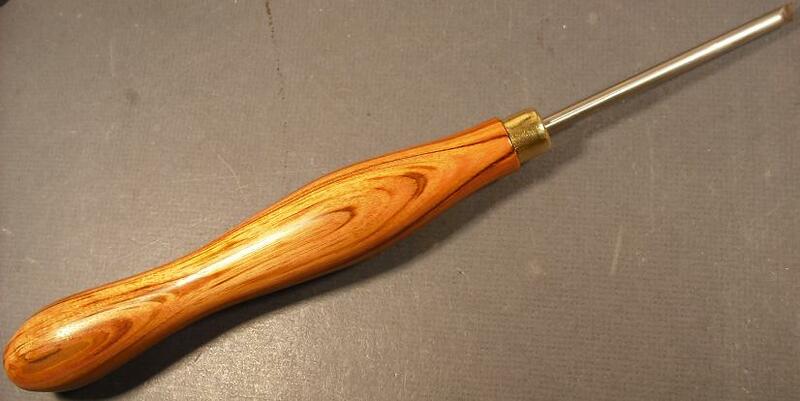 A click pen made using Oregon Myrtlewood. This one was for my sister who lives in Portland. This one above was from some Hawaiian Koa wood in a click pen kit. My wife liked this one so much it is hers now. The pen above is made from a piece of Palo Sangre wood (aka bloodwood) that my son brought back from a recent trip to the Amazon River in Peru. The keychain is made from Hawaiian Koa wood, which is sort of irridescent, like Tiger's Eye stone and the pattern changes as you move it in the light, chatoyance, they call it.. The keychain kit is one of the detatchable keyring kits from Woodcraft. 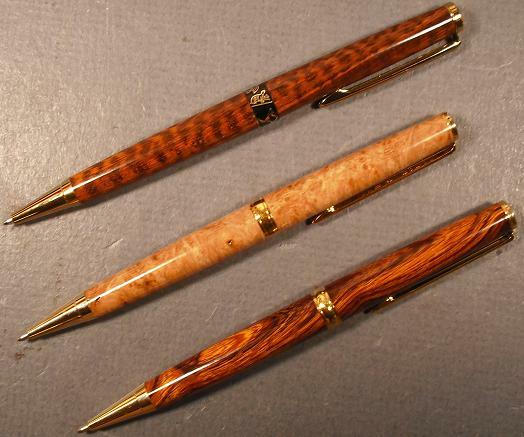 Top pen is made of river gum burl, also known as red gum, a type of eucalyptus. Lower pen is bois du rose. A friend wanted a pen made of dogwood, but I hadn't ever seen any for sale, but some dogwood burl pen blanks turned up on the internet so I grabbed a few and made him this pen. This wood is a Rosewood from Laos, made with the streamline pen kit, nice hard dense pretty color wood with contrasting grain pattern. Some other stuff I have been making. This is a mallett with the head made of Lignum Vitae wood and the handle is persimmon wood. Both are very hard woods, and the lignum vitae is so dense that it sinks and is about 4 times as hard as oak. I turned the head and the handle on the lathe. I wanted a small skew chisel with a round shaft, but the smallest one I could find from Crown Tools was 3/8 inch, so I made one myself from 7 mm steel shaft and a Jobillo wood handle, and a little brass ferrule that I got off ebay. It came out so nice that I might make a couple more for some fellow pen turners. This is a cure little bud vase about 8 inches tall made of zebrawood, turned on lathe. Finished board, with side rails for rolling a specified thickness of dough, 3 mm in this case. Main board is rock maple, rails are Brazilian cherry. This was a new one for me, making an old fashioned shaving brush. 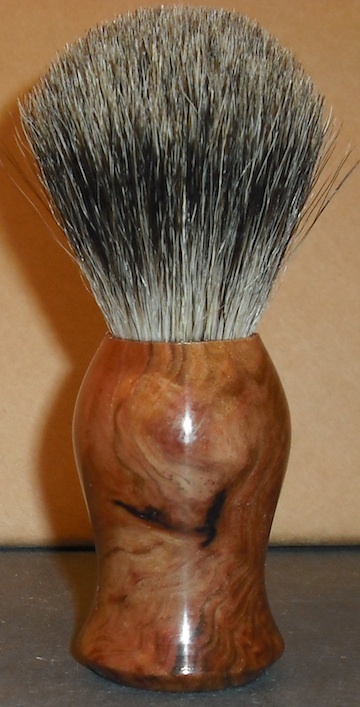 I used a piece of Jarrah burl, and a 20 mm badger hair brush knot and made this brush for a friend. This pen is made from a rare and beautiful wood called Chakte Viga, and this is a burl from that wood. It uses a twist pen kit that I ordered from Australia, and it has Australian animals on the center band. 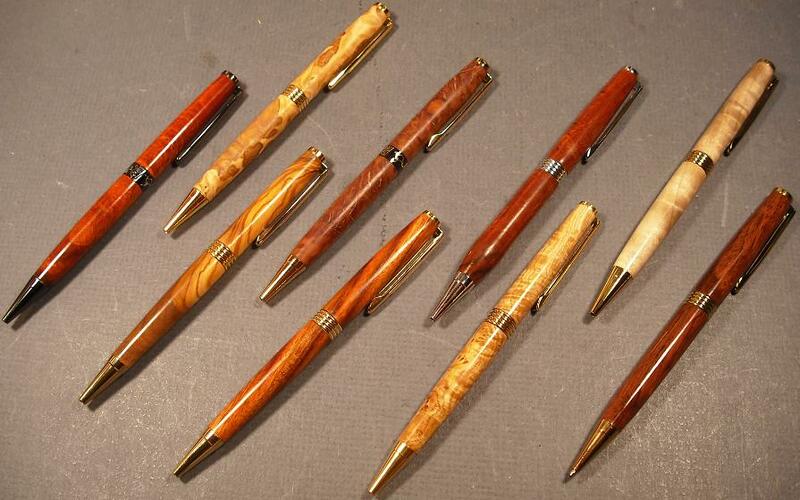 Here are a batch of the Streamline pens in various woods. Woods used left to right: Chakte viga burl, eucalyptus burl, Olive wood, Coolibah, Jabillo, Chakte viga burl, Black Ash burl, Satinwood, and Bannia wood.